Josey Cirrinni recieves some unexpected help with a problem she didn’t realize she had and meets Chloe Finley in the process helping her as well. 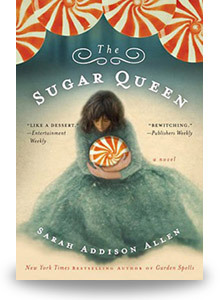 So far i have read 3 of Sarah Addison Allen’s books and have not been disappointed. Another book filled with friendships and magic. Imagine a book appearing next to you on the couch addressing a problem you might not even realize you had! Chloe and Josey help each other with their problems another’s mind is set at ease allowing her to move on to the next step in her journey. Josey’s decision that morning set in motion things that she could never have imagined. i was not surprised at the end of the book when the final outcome was reached, but getting to that outcome made for a wonderful story.